Artist´s Statement: Cut, Kopieren & Einfügen, Posten, Teilen, Retweeten, Gefällt mir. Meine Arbeit erkundet die mediale Sintflut flüchtiger Texte und Bilder und die Art und Weise, wie diese Kakofonie bildlicher Darstellung unser Verständnis der globalisierten Welt verändert hat. Der Dauerbeschuss von Information – Information, die fortdauernd durch die sozialen Medien strömt – und die mit ihr verbundenen Nachrichten haben eine Dringlichkeit erschaffen, die auf‘s Heftigste auf das JETZT fokussiert ist. Diese oft hastige und theatralische Natur medialer Aufmerksamkeit erhöht impulsive Reaktion und lenkt von eigentlicher Betrachtung ab. Meine grafische Arbeit und meine Installationen benutzen diese Informationen nicht als Ephemera, sondern behandeln sie vielmehr als körperliche Darstellung – ihre Vielschichtigkeit wird so zu meiner mir eigenen visuellen Ästhetik. Die Vermischung von Themen, die als „seriös“ angesehen werden, mit jenen volkstümlicher Art wie Twitter und Facebook – hier versuche ich die Darstellung, die den Kontrast zwischen Belanglosigkeit und Wichtigkeit definiert. Artist Statement: Cut, Copy Paste, Post, Share, Retweet, Like. My work explores the deluge of ephemeral text and imagery presented by media and how this cacophony of imagery has altered our understanding of the globalized landscape it presents. The bombardment of information that streams on social media sites and news outlets create a sense of urgency that is intensely focused on the NOW. The often haste and theatric nature of media information elevates the impulsive reaction and dissuades from proper reflection. Instead of representing a traditional narrative the consumption of information blurs from one source to another flowing from Facebook to Wikipedia to Reddit and other sources of information. This presents us with a fragmented narrative that is layer with preference to what is liked or voted up. Rather than representing this information as ephemeral my print and installation work uses this information to build a physical history built in the layers of information that makes up my visual aesthetic. Blending issues that are viewed as “serious” with the vernacular of Twitter and Facebook I seek to create imagery that is indicative of contrast between what is considered trivial and significant. 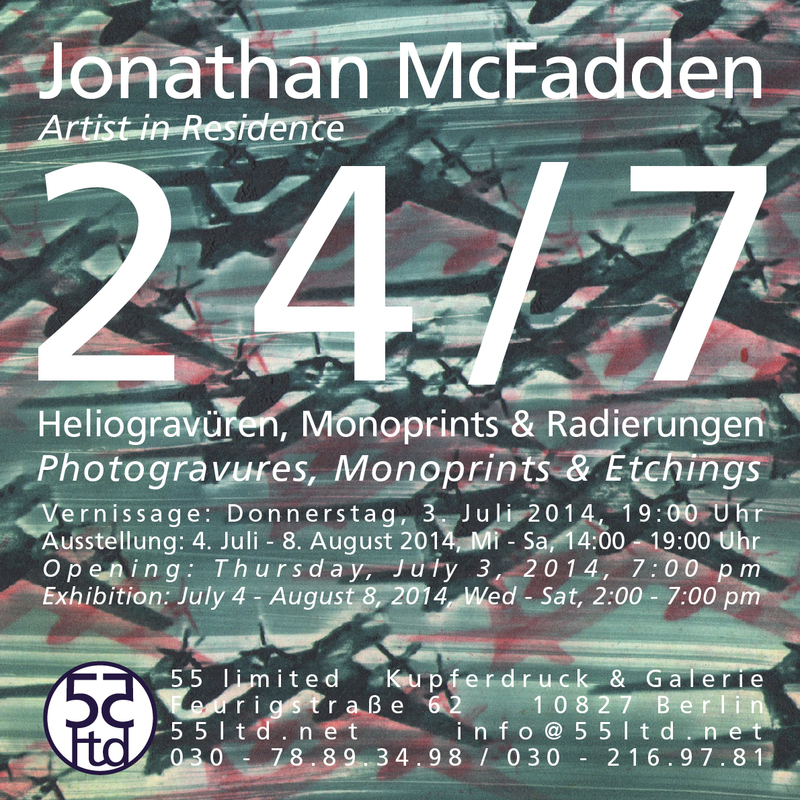 Jonathan McFadden holds a MFA in printmaking from Edinburgh College of Art, BFA in Printmaking, and BA in French from Texas State University. His work has been exhibited at the National Gallery of Scotland, Royal Scottish Academy, University of Texas- San Antonio, University of Wisconsin- Madison, the University of Minnesota, 621 Gallery, Highpoint Center For Printmaking, Wichita State University, Millsaps College, and many other national and international venues. In 2010 and 2011 Jonathan was a Jerome Resident at Highpoint Center For Printmaking Jonathan has previously taught at Minnesota State University and is currently Assistant Professor of Printmaking at the University of Kentucky.